On Easter Sunday, my daughter Bryn and I had a completely spontaneous day in Istanbul. We had planned to take in two of Istanbul’s major tourist attractions, but our host invited us to have a Turkish breakfast. How could we turn that down? After a delicious and leisurely breakfast, we thought we could still knock off one of the “must see” attractions. As we were preparing to head out, we heard a lot of activity down in the street below us and were informed that there was a soccer game about to begin across the street. Although we had been living in Selim’s apartment since Tuesday, we frankly hadn’t noticed the stadium because it is built into the hillside and does not have much of a street presence. We looked out the window and, sure enough, there were hundreds of men buying tickets, taking group photos, and gathering for the game. As we headed down the stairs, Bryn asked whether I was interested in checking out the activity before we moved on. Open to an adventure, I assented and before long she was bargaining with someone for tickets. We checked in with our hosts to make sure we weren’t getting ripped off and purchased two tickets for 30 Turkish Lira (about $17 or 96 DKK). As we headed to the entrance gate, I saw a lot of armed police and wondered if Turkey was one of the countries with rabid soccer fans. Vague recollections of news stories of trampled fans nagged at me briefly, but we followed the crowd and joined the queue. Need I mention that we were the ONLY women present? After waiting in line for about five minutes, a few men started speaking to us and motioned that we should go around to the outside of the crowd. We suspected maybe women were supposed to enter somewhere else, but it turned out they just wanted us to be able to skip the queue and enter expeditiously. Stadium security confiscated the plastic tops from our water bottles (potential projectiles we later figured out) and we followed the flow of fans. It soon became obvious that the seat numbers on our tickets were academic. Someone handed us blue and white flags to wave for the home team and we headed for the seats. We followed the crowd and looked down into the stadium section where they were going. 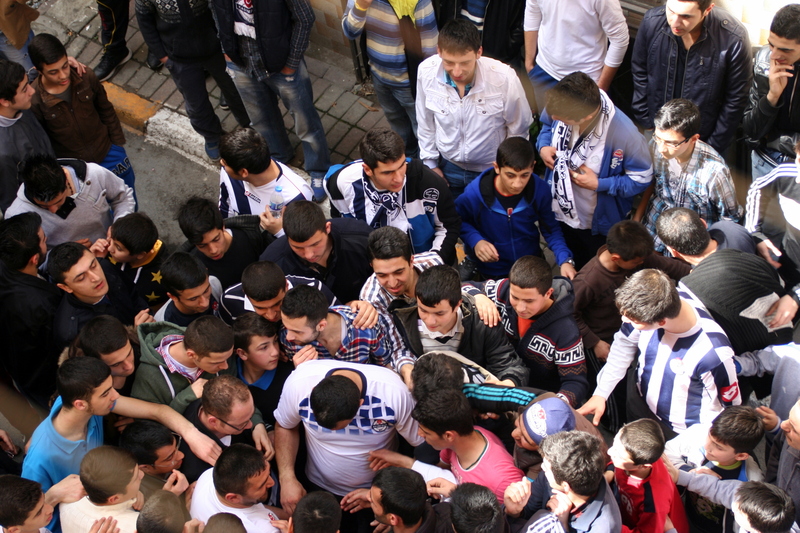 All we could see were men, lots of them, packed tightly together. We turned around to go to the next section of seating, which hadn’t starting filling yet, but were turned back by a policeman. Resigning ourselves to go into the full section, we headed back, but were stopped by another policeman, who motioned for us to continue with our original strategy. So we turned around, only to be stopped by the same policeman as before, so once again we reversed directions. This time, the second policeman accompanied us and explained to his colleague that we should go into the empty section and then make our way to the edge of the full section. 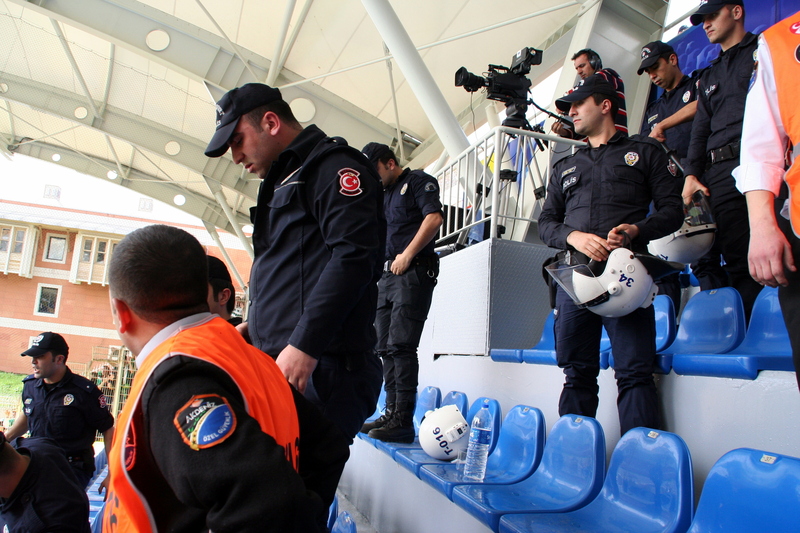 We then discovered that the police intentionally keep an entire section empty to act as a buffer between the local and visiting fans. A line of police guard the empty section to make sure the fans don’t interact. 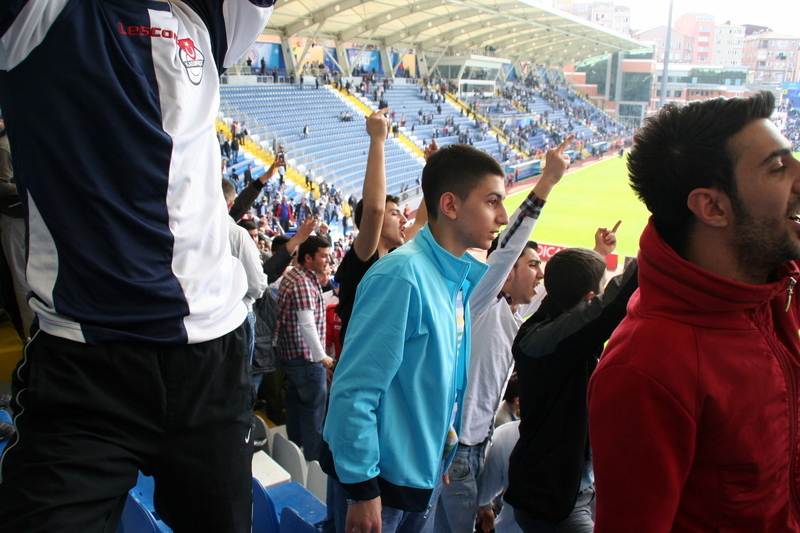 Through hand signals we were instructed to go past the police and sit between them and the local fans. I felt good about being right next to the police. We had missed the first 15 minutes of the game, but it was still scoreless. Having watched a lot of soccer when my children played, I appreciated the skill of the players on the field. Just as entertaining, however, were the fans. 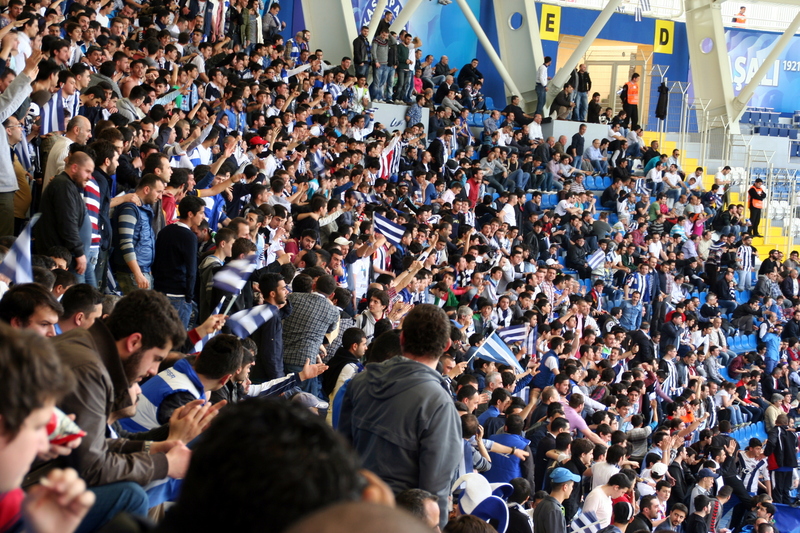 Both the locals and the visitors shouted during the ENTIRE game, non-stop. 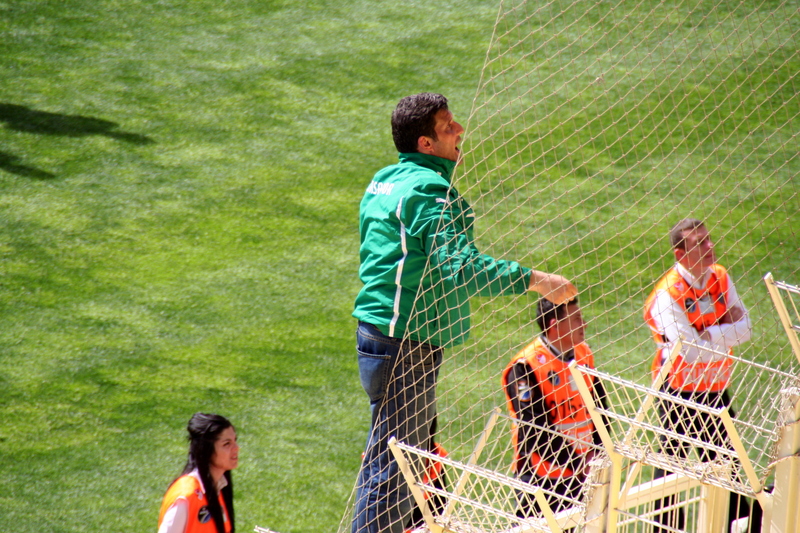 As an added precaution to make sure there was no trouble, the visiting fans were locked inside a cage. The only one outside it was the guy leading the cheers. 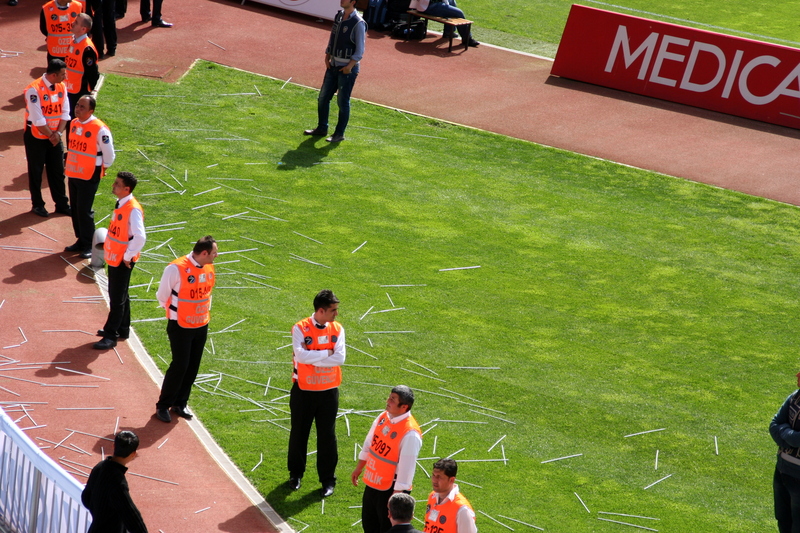 The game proceeded with two yellow cards for the home team, a couple of players injured and carted off the field, three young fans getting hauled away after they somehow managed to get out onto the field, and a growing pile of sticks as fans dismantled their flags and threw the sticks towards the field. I acknowledged the wisdom of the security staff having confiscated all bottle tops. In contrast to American professional sporting events, there were no concessionaires selling food and drink in the stands. With 95% of the population being Muslim, there was no alcohol for sale or consumed in the stadium. Considering how excited and vocal the fans were without alcohol, I wondered how crazy they would have been under the influence. And then the game was over, the local team victorious. Then the real excitement began. The opposing fans started screaming at each other. The blue team’s fans taunted the green team’s fans and made obscene gestures. The green team’s fans shouted back and the police got ready to intervene, if necessary. The blue team’s fans made a rush at the police line, meaning they came at Bryn and me and climbed around us trying to get past us and the police. The two of us stood there bewildered, snapping photos. One of the guys who had been leading the cheers for the local team, came over to calm people down and encourage them to leave. 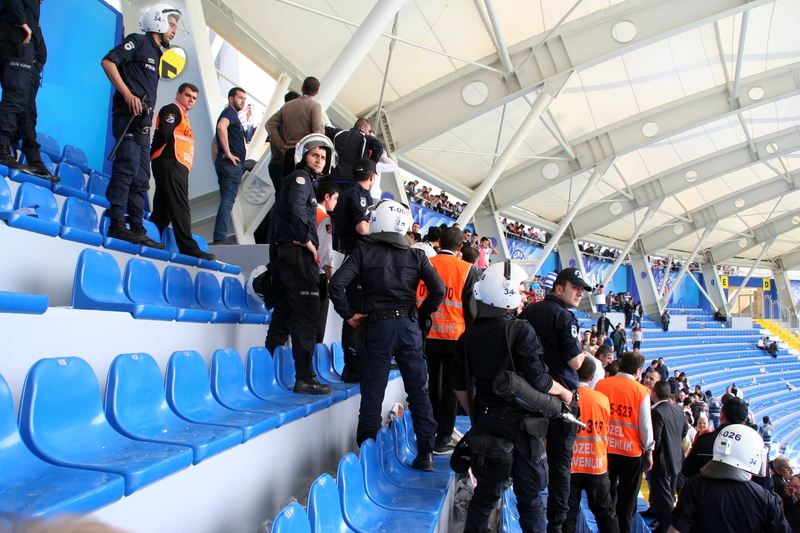 The police directed us to get behind them and wait for the stands to clear out a bit. 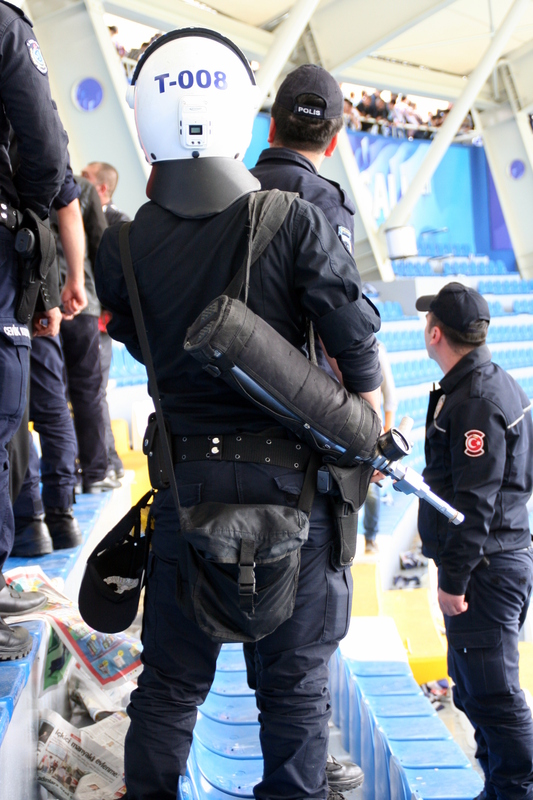 I noted the riot gear and tear gas canisters and was happy that it wasn’t proving necessary to use them. We waited and left after most of the local fans had already gone. 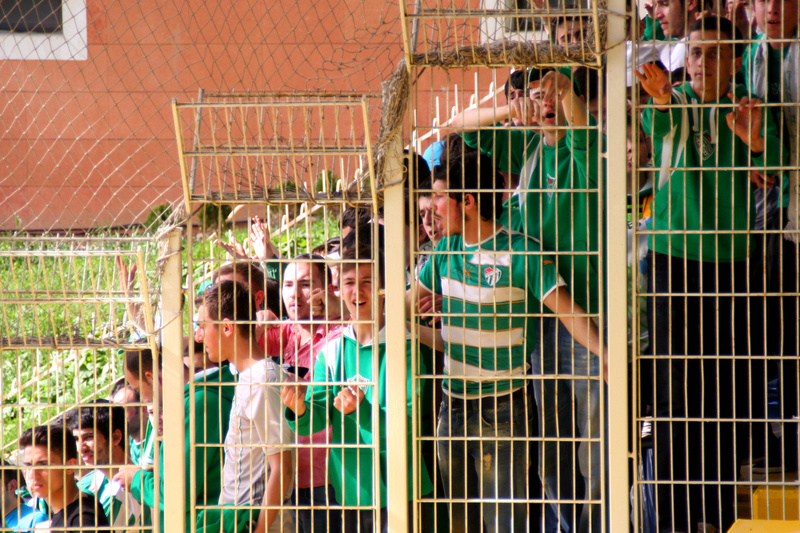 The visiting fans were still locked up in their cage. About a half an hour later as we waited at a bus stop to go on our next adventure, we saw busloads of visiting fans departing, being escorted by vans of police. Going to the game probably wasn’t the smartest thing we’ve ever done, but we enjoyed experiencing the local color and came away unscathed. What a fascinating account of your exciting experience! So glad you were safe and also that you sat by the police line! That seems a little different than our days on the fields at Rice Lake and Centennial with Mark as our ref!.. Thanks for sharing.